Note that since this post, these pack liners have become a permanent part of the Zpacks site. Check them out Here! I am happy with my (1.2 oz) ZPacks cuben fiber pack cover and have no plans to abandon it, but past experiences have proven that a pack cover will not keep the inside of a pack dry on its own. And now that I have started carrying more down items I figured it would be wise for me to pick up a waterproof pack liner. But after thinking about it, I decided I didn’t just want a pack liner that I would be swapping out every so often. Instead, I wanted to look for a fully waterproof dry sack that would function as a pack liner. So, I began looking for one that would fit inside my ULA Circuit as best as possible. I looked at the Mountain Laurel Designs large size dry sack bag, but it was just a tad smaller than I wanted. I was stuck on the size 18×36 and this one measured 17×35. (Yeah, I was being nit-picky here.) But at the moment, this one was leading the pack since Lawson’s were out-of-the-question for the time being. And the price was pretty nice on this one too, $37. If you can’t tell from the video, I am very happy with this dry sack pack liner. It fits inside my ULA Circuit perfectly, it is very light-weight and being that it is made from cuben, it should be very durable (much more so than a trash compactor bag or some of the cheap pack liners). And of course, Joe has done a superb job, both on constructing as well as designing this dry sack. The hook-and-loop fastener that runs across the top not only makes it easy to close the top of the pack, but it also keeps the top stiff making it easier to roll closed. And of course, the highly waterproof cuben fiber should do a great job at keeping my gear dry! So, thanks for taking the time to read this post as well as watch the video. If you have any questions just drop them at the bottom of the page and I will get back to you! This entry was posted in Dry Bags/Stuff Sacks/ Pack Liners, Gear, Gear Stores and tagged 1.26 oz/sqyd cuben fiber, AT Thru Hiking Videos, Cuben Fiber Dry Bag, Cuben Fiber Pack Cover, Lawson Kline, Mountain Laurel Designs, Outdoor Research, pack liners, UL Dry Pack Liners, ULA Circuit, Wallace Hunter, waterproof dry sack, ZPacks. Bookmark the permalink. I like the blog and enjoy seeing your progression to ultra-light. I just started myself. I wanted to know how the duribility is on the stuff sack. I have a brand new catalyst that I am going to test in Sipsey in a few weeks and want to not have to carry a pack cover. My buddy who is a PCT/AT thru hiker says it’s a good idea but there is no way it could make it without getting holes on a thru hike. What do you think. He is going to finish his triple crown this March and wanted to know how tough the bag is. Thanks again for your help. 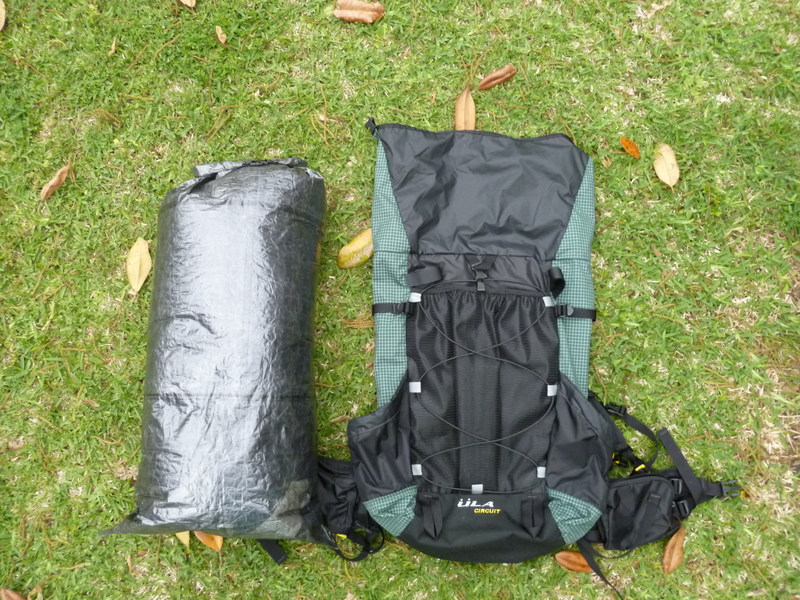 Very good review the pack liner. Could you tell me what you’re sealing the seam with, I didn’t catch that. I must warn you, I think you’re about as demented as me these days! I had Joe make me an oversized stuff sack about a year ago for this very purpose. His comment back was very much the same, no problem. Mine is 11 x 4 1/2 x 26 and weighs .65oz total after seam sealing. I have since made one for a friend and they are very easy if you have some basic sewing skills. Cuben is much easier to work with than silnylon, but too expensive for mistakes. I learned to sew the first few backpacks with 1.3oz silnylon and made plenty of blunders (a seam ripper is your best friend!). After you get used to it, it’s not too difficult. Have you tried taping cuben rather than sewing it? I tried the cuben tape from quest outfitters but it didn’t work well. I think cuben got a bad reputation for being sewed when using the extremely lightweight material. The heavier stuff like the 1.43oz I use on backpacks has a very thick wall and lends itself to sewing very well. I haven’t messed around with gluing seams because I’ve heard it’s very messy and slow. I just seam seal and it works great! Thanks for the heads up about the cuben tape. I was debating getting some when I place another order form them one day. Also, I can definitely see how the lighter weight cuben would not hold up well with sewing. Although, I have found the stuff sacks Joe has made (which I believe is 0.51 oz/sqyd) to hold up rather well, at least so far. On a different note, I found that the corners of the dry sack were harder to seal than the rest. After it dried some of it began peeling at the corner so I had to redo them. Wow only 15 ounces for that thing!! The “Windrider” from HMG is 25 ounces (1.6 pounds) [708 grams] and is waterproof as well. I cannot seem to find how many cubic inches the czimmer pack is… anybody know? These days I mostly use my ZPacks Zero (Cuben Fiber X-Small, Sternum Strap, Cuben Fiber Shoulder Pouch) at 3 ounces or my ZPacks Blast 26 at 6.3 ounces, than I put everything into CF bags. I have a CF DryBag from MLD that I put my sleeping bag and jacket into, encase I take a fall in a river or something. I waas just thinking about getting a good dry bag to keep my stuff dry. This looks like it might just be the ticket. Thanks for the info. Great post. Joe offers some great products, and at a great price. Just keep in mind that he sews his cuben so if you want it to be fully waterproof, ya gotta seam seal it!